On February 6th 2015, I earned my first cap for my country. Well, not exactly a cap for Wales, but my first appearance for the National Assembly for Wales’ rugby team. The location – Arms Park. Me! 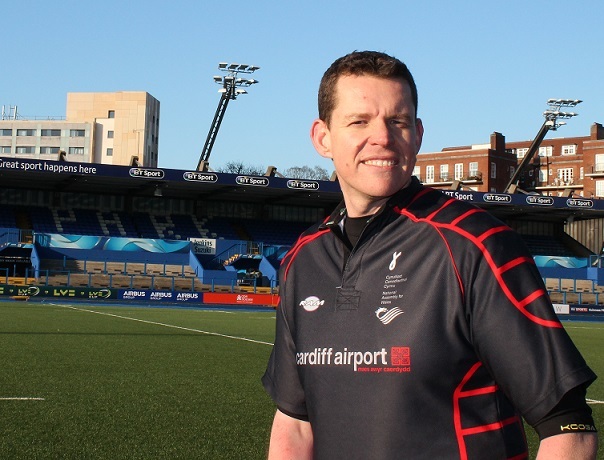 Playing rugby at the Arms Park! I couldn’t believe the honour. In the changing room, our team came together – shoulder to shoulder, arm in arm, with deep heat on our legs and tape over our ears (and a little extra tape to keep the more ‘mature’ bodies from coming out of joint!) – to sing Hen Wlad fy Nhadau. The buzz was amazing, and each one of us full of passion as we faced the task ahead in the name of Wales! Next door, in the Millennium Stadium, Wales were preparing to play England in the Six Nations, and on that day – something that has become a tradition by now – the National Assembly for Wales face the House of Commons and the House of Lords. In front of a crowd of some hundreds, it was a tough, physical game. I was on the wing. A chance for an early tackle on MP Alun Cairns brought a smile to my face and a cheer from the crowd. My fellow-AM Andrew RT Davies made a short pass ‘through the back door’ to create one try and I (honest!) had the thrill of being part of the movement passing the ball through the hands on the way to another try. I had a blow to my left shoulder three quarters of the way through the game, and left the field, but the hard work had been done and we were on our way towards another famous victory. The final score 33-14. Over a pint afterwards, we sympathised with Welsh Secretary Stephen Crabb on his hand injury. He was in plaster for some weeks after. The brightest players were rewarded. But it was mostly an opportunity for all of us, the players, the support teams, the organisers (and the fans of course!) to remember that there is a purpose to this, with thousands of pounds raised for our charity, Bowel Cancer UK. My first cap. But not the last!